I take part in the SpinDoctor Rare Breed Wool Challenge on Ravelry. My blog posts are tagged SpinDoctor. The challenge ends June 30th 2011. You find SpinDoctor's podcasts in my Link List to the right. Black Welsh Mountain is an old sheep breed. Black sheep were bred already in the middle ages in Wales. It's a small sheep that produce both meat and wool. There are Black Welsh Mountain sheep in England, Scotland and of course in Wales, but also in the USA. The wool is black or reddish with a micron count of 32-35, American sources says 26-32. The staple length is 8-10 cm. It's mostly used for cloth, but can be used in knitting also. The lambs have a deep black color. I got combed top from Sarah when she visited Malin and me in February. This is one of the coarsest wools I have spun. It felt surprisingly soft, and the preparation was excellent. I tried short forward and short backward draws but settled on semiwoolen. I tried to draft thicker than I usually spin, but it's not easy for me. The result was a 2-ply yarn softer than I had assumed it would be. It would be a perfect yarn for outdoor use. Jag köpte en sådan där grej som man gör blommor med. Och samma dag gick solen upp bakom mitt isiga fönster. I'm overwhelmed and happy. And wondering when I'll have time to spin and knit all this and all the other fibers and yarns in my stash. But, it's better to have a stash than not to have a stash, right? And I got another of those fancy Tesco bags with the ladybugs. I got Ladybug chocolate too, but for some reason I don't have any to show you :)) Now I only need a Schacht Ladybug to accompany the Tesco bags. We took a look at handicraft from Southern Ostrobotnia in Rustoopuori in Seinäjoki, but I didn't take any pictures and they don't have a good website, so I won't write any more about it than it's a shop where professional crafters sell their products, or better said: show their products. You can find high quality handicraft to a high quality price. We stopped at Juustoportti, where almost everyone going from Vasa to Tampere stops to buy cheese. Juustoportti makes strong hard cheeses, goat cheeses and a very good Leipäjuusto, which is a fresh cheese slightly baked for a tasty surface. You can use that cheese just as it is with bread or biscuits, or slightly warm it up with a bit of fresh cream and eat it with jam as a dessert. In Finland we often eat cloudberry jam. Or you can use it instead of feta cheese. I love Juustoportti's goat cheeses! The sheep is sitting in Black Welsh Mountain I also got from Sarah. It's made of bamboo root. To the left is some Welsh Mountain you can't see in the photo. Oh I have so much nice fibers! The other yarn shop we visited was Lankatalo Tapion Kauppa. I have blogged about that shop earlier here: LYS. It's big, it's in the middle of nowhere, and it's a bit too much. I did well, I bought only one bag of yarn that I really needed, i.e. some sock yarn for a blanket I started crocheting and frogged and then changed to knitting. Of course I didn't buy enough yarn the first time I went to Tapio, and luckily they still had it. There are pics in Sarah's blog! We where quite happy and a bit tired, but we still did some spinning and knitting when we came home in the evening. When Sarah and Malin left hubby's and my dog Kasper fainted I think. At least he slept for almost one day. And when I said "fishyface" several days later he started looking for Sarah. I won't tell you why. Jag glömde ju alldeles bort att jag skulle visa makens Double Fun sockor som jag började sticka i december. Visst blev de färdiga, och det för flera veckor sedan! Jag har t.o.m. tvättat dem en gång redan. I completely forgot I promised to show hubby's Double Fun socks which I started knitting in December. I finished them several weeks ago! I have even washed them once. The American small holders have bred for fleece trying to preserve the historical look of the sheep, while in UK other breeds have been introduced in order to get bigger sheep for more meat. The color of the sheep is piebold, spotted in black (dark brown), gray (also called "lilac"), and white. The sheep looks hairy and shaggy, but the fleece has no outer coat. The wool from American Jacob is much appreciated by handspinners. 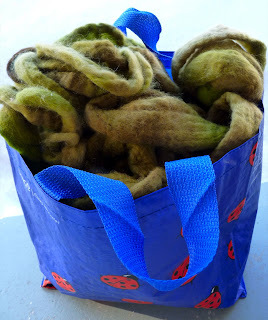 I scoured the fleece sample, and when it was dry separated it into small heaps of white, brown, light gray and a little bigger heap with colors that couldn't be easily separated. I combed the white, brown, gray and mixed heap as they were and spun four 2-ply yarns. But first I took some of the white and brown aside and combed and spun a humbug yarn, and some of the white, gray and brown into a darker gray yarn. I got six nice yarns. The staple length was 4-8 cm, the brown being the shortest and most difficult to comb and spin. My nice Louet one row mini combs are fantastic! They comb almost anything. When washed I found that the hand of the yarns goes from the soft in the white to the little coarser in the brown according to color, so the dark gray is in between. That is normal, as colored fleece usually is coarser than white. The white skein has a luster I think is semilustrous, the brown has almost no luster. The rest are in between those two. There was no kemp and the wool was very soft, so I think I got lamb's wool in my super sampler package from The Spinning Loft. Some lambs may have outer coat which is later shed, so perhaps my fleece was from a second shearing. Hard to say for me. I know almost nothing about Jacobs. This was lovely Jacob, and it was fun to work with. Last year I spun German Jacob from mill carded roving, and it was coarse and full of kemp, so I didn't like it very much but thought it would be good in a cardigan or sweater. I'm still knitting that sweater... it sheds all over me and I keep thinking it will never stop. I have to put a lining in it if I ever get it finished. Solen är här! Det är -23C, disigt och vackert. Just nu går solen i moln, så det blir varmare. -15 lovar de till eftermiddagen. Det här är en underbar tid på året. Grannarna har lagt skidspårsbotten inför vårens turer, och Kasper kollar vem som gått på vägen. Harar och rävar och katter brukar det vara, och någon hund ibland. CVM, Californian Variegated Mutant is a subtype of Romeldale. The history of the sheep is a series of crossings including Corriedaly, Marsh Romney, American Rambouillet. The breed was called Romeldale, and was established in the 1950s. CVM was developed in the 1970s from a couple of colored sheep with badger face found in a flock. The status of the sheep is critical with only a few breeders. The wool is fine with much crimp in offwhite, brown, gary, black, moorit. It is used in all kinds of garments. It was developed for handspinners, and handspinners have taken it to their hearts. Preparation: I had a sample of raw fleece which I scoured and then combed with Louet one row mini combs. Usually CVM has much lanolin, but I didn't notice that in my small sample. It was easy to wash and easy to comb. I didn't try carding. I spun with a semi-woolen draw and plied a 3-ply yarn. The yarn is one of my very best, a lustrous, soft and still resilient yarn well suitable for socks or sweaters. I was surprised of how nice the finished yarn was. Conclusions This fiber has been much praised, and I join the choir. I wonder how I could get a fleece or two? You don't find this in Europe, and shipping from USA has it's disadvantages. I'll solve it somehow. I take part in the SpinDoctor Wool Breed Challenge on Ravelry. My blog posts are tagged "SpinDoctor". The Challenge ends June 30th 2011. The wool is white to creamy, with a staple lenght of 5-8 cm. The micron range is 29-32. "The main uses of the Clun fleece are fine hosiery, felts, knitting wool and futons" says The British Wool Marketing Board, and the North American Clun Forest Association says it's a fiber for handspinners. The fleece is dense and fine with a crimp that make the fibers bounce away from each other. Below a hand combed top. There was 2 oz of raw Clun Forest in a sample package from The Spinning Loft. The wool looked dense and finely crimped, felt bouncy. I scoured the wool, and when it was dry I tried carding a few locks, but it was difficult so I didn't want to continue. I rolled it off into a puni. When I stretched it I got a dread lock! For a moment I felt a deep temptation to dye the fleece and only make dreads :) But first I tried the dog comb, and that was not good at all. Then I tried my one row Louet mini combs, and got a bouncy good looking top. So I combed the rest of the wool and thought I'd try to remember the dreads if I ever wanted to make more of them. Fibers carded into a rolag and stretched - a dread lock! Spinning was easy. The tops were like bubble gum, stretchy and bouncy. I spun two different yarns from the same hand combed tops. I plied both yarns into 3-plies on my midi bossie. 1st sample: I wanted to try a woolen draft for these rolag looking combed tops, so I used my wonderful supported Skimo spindle for a semi-woolen, double drafted technique. I really liked that! The yarn felt soft and quite stretchy. 2nd sample: I then spun a classic worsted yarn on a mini bossie. The fibers ran soft and smooth from the tops. The yarn felt less soft and stretchy than the semi-woolen, just as it should. I knitted a swatch with 22 stitches on needles 3 mm. The woolen yarn has less stitch definition because it's softer. The worsted yarn was fast and nice to knit, a very good yarn if I may say so myself. For a sweater I would choose the worsted yarn. It has greater luster and feels strong. A very nice fiber at least in this sample. One have to remember that I only used a very small sample from one fleece, so fiber from another part of the fleece or another sheep might be totally different. I would certainly like to try more of this wool. Deborah Robson & Carol Ekarius, The Fleece & Fiber Sourcebook. Storey Publishing, to be released May 2011. M. L. Ryder, Sheep & Man. Duckworth, 2007.